Frontiers Magazine | Which way will the kite blow? Which way will the kite blow? Generating electricity from kites is a developing technology. Hands up if you visited the original 3MW wind turbine on Burger Hill, Orkney in the 1990s. In its day it was the biggest wind generator in the world. Today that lumbering, two-bladed monster on its tapered concrete tower has gone the way of Homo neanderthalensis, superseded by tribes of slim, elegant, smart, three-bladed Turbo sapiens which have become the dominant species. 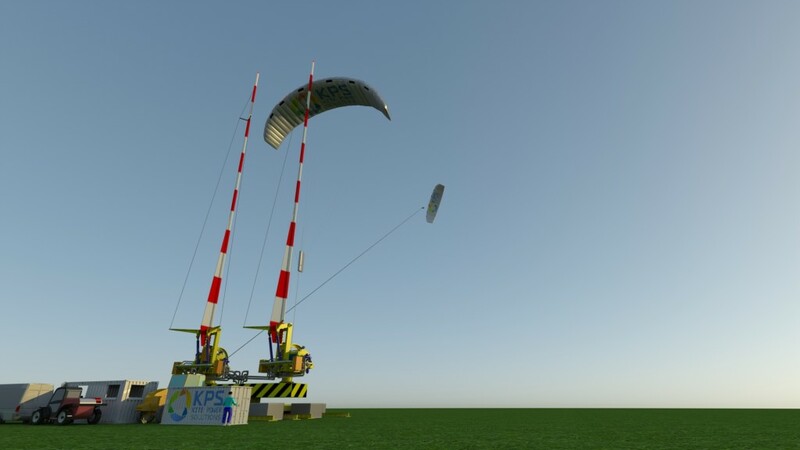 Will one design come to dominate energy kites – the next development in wind power. If so, which one? The idea of using a kite to generate electricity is not a new, but advances in aerodynamics, materials science, computer control and artificial intelligence are encouraging engineers and big business to invest serious time and money. Why? Because the higher you go the stronger and steadier the wind. The limit for a bladed wind turbine is about 100 metres: a kite could fly up to 1000 metres. Everyone agrees that kites are cheaper to manufacture, install and service, require far less concrete and steel in their foundations, are less visually intrusive and seem ideal for offshore wind farms. But there is still disagreement among rival development groups as to the basic design. We are at the stage when nobody is quite sure whether phonographs should record sound on cylinders or disks. Should the electricity be generated aloft or on the ground? Should the aerofoil be rigid or flexible? Should the kites work singly or in pairs? Each time engineers make a decision, the kite evolutionary tree forks. 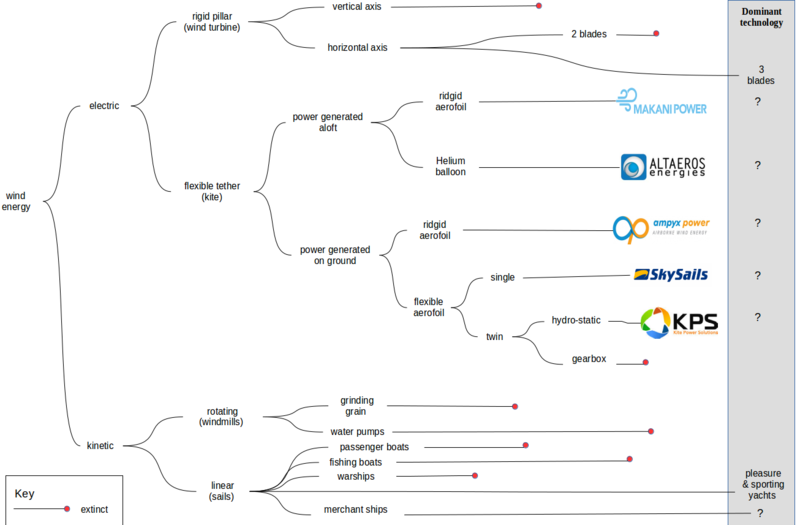 Each time there is a fork the big investors such as Google (Makani), MIT (Alteros), European Union (Minesto) and Shell (Kite Power Solutions) worry whether they have backed the design which will become the dominant species or one which is doomed to extinction. The KPS species has twin kites, one reeling out – generating electric power and one reeling in – consuming electric power. The ingenuity of the design is that the kites have dynamically adjustable aerofoil configuration so that ‘in’ uses less energy than ‘out’. There is a net production of energy on each cycle. The companies now have some patents on this design, so if it turns out to be ‘the winner’ it will be a big winner. But will it win? Can we look into the future? We humans often suffer from the illusion that prediction is feasible because we mistakenly consider it to be the mirror image of retrospection. Re-tracing the path downwards through a branching tree is simple – we always end up at ground level. But if there is even the slightest uncertainty or randomness at each fork, it is very unlikely that we could successfully trace upwards through a repeatedly branching tree to that single leaf which represents the actual future. Another possibility is that, unlike wind turbines, kite power will not converge on a dominant solution. Some technologies seem to converge – such as bicycles, home/office computer operating systems and elephants, while others such as can openers, computer graphics file formats and beetles seem to evolve new species annually. If you have Orcadian connections and fancy a flutter on the High Flier Stakes, why not cheer for the local runner – Kite Power Solutions? A non-technical reason is that the Lead Mechanical Engineer is George Tateson – ex Stromness Academy and Aberdeen University. He is part of a team of engineers, software code writers, aerodynamics experts and sail makers. They are a British enterprise based in Essex at the moment but are intending to move their HQ to a larger site in Scotland in time to test their next – and at 500kW their most powerful – prototype. The Scottish Government is putting money into this. They and the other big backers will be watching several performance criteria intensely, reliability being one of them. George says that reliability was the main reason the team decided to fork from a gearbox to the emerging technology of hydro-static transmission. This and hundreds of similar, critical design decisions will determine whether their kite power solution soars or flops. So which direction will kite energy take?